Jacques Anquetil was the first rider to claim five Tour de France wins. His undeniable superiority lay in his time trialing capabilities, which not only fed his Grand Tour victories but also gave him nine wins in the Grand Prix des Nations (between 1953 and 1966) as well as the Hour Record in 1956. Felice Gimondi, known by his fans as “The Phoenix”, is often described as the most perfect all round road cyclist ever. This elegant and highly gifted rider exuded the flare associated with Italian style. Like so many of his generation, Gimondi would undoubtedly have amassed an even longer list of significant victories had it not been for the fact that for much of his career he had to compete against Eddy Merckx. Eddy Merckx, “the Cannibal”, is by any reckoning the greatest racing cyclist of all time. He is credited with the most professional career victories of all with 525. But it is not only the quantity but also the quality of his wins. Multiple Grand Tours, classics, World Championships and many other important races. His stupendous career started in 1961 and finished in 1978. Bernard Hinault first appeared in the professional peloton as Merckx was concluding his career. Known as “the Badger”, Hinault was famous for his incredible toughness, which linked with his natural talent, produced one of the most formidable champions of all time. He hated the cold yet one of his most famous exploits was during the 1980 Liege-Bastogne-Liege where he rode away from the peloton during a blizzard in the Belgian Ardennes to win by over nine minutes. During the 2008 Tour de France Hinault showed that the old fighting spirit has not at all diminished, when a protester attempted to ascend the podium during stage end presentation. A great picture shows Hinault in horizontal flight just about to connect with the hapless protester! 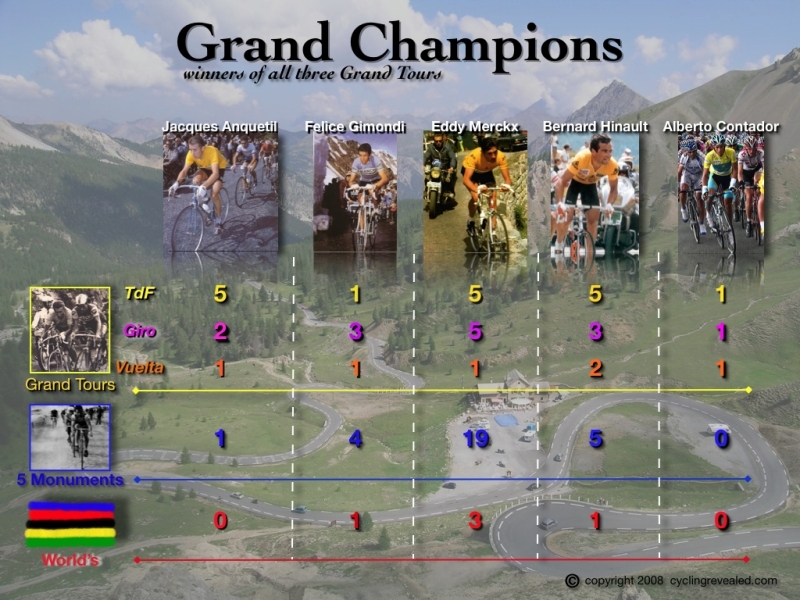 There is little doubt that Contador is a highly gifted athlete who deserves to be compared to the other four Grand Champions discussed here. 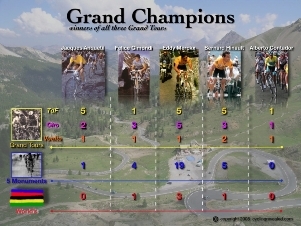 At the tender age of 25 he has plenty of time to build on his already impressive list of Grand Tour wins. He does not demonstrate the voracious appetite for victory of a Merckx or the raw aggression of a Hinault. He does however show a little of the aristocratic temperament of an Anquetil and the style and flair of a Gimondi. Coursing through Contador’s veins is the natural athletic ability that also blessed his four illustrious predecessors. Although blessed with the tools to do the job, Alberto Contador will probably never win such a broad variety of races as his predecessors. The reason has little to do with ability and everything to do with money. Until Greg LeMond in the 1980’s professional racing cyclists depended on the lion’s share of their income from ‘appearance money’. Team contracts were meagre compared to today’s often multi-million dollar agreements. And endorsements were also a very minor income generator. Today the big stars command huge contracts and make a second fortune from commercial endorsements. Appearance money at local races is little more than ‘chump change’! Prior to LeMond the big stars used their status to secure sizeable “appearance” fees at numerous races across Europe. Jacques Anquetil’s appearance fees were so lucrative he gave his entire Tour winnings to his team. As soon as the Tour was finished he drove all over Europe appearing at small town criteriums and other local races for huge appearance fees. A look back at the winter six-day race season also reveals Anquetil, Bobet, Van Steenbergen, Van Looy, Simpson, etc. exploiting their super-star status. Such riders were quite simply the star attraction that would fill the indoor tracks with paying spectators night after night. With the modern financial model today’s stars no longer have to embark on gruelling travel schedules or race in smoky indoor tracks to pad out their bank balances. For seven years Lance Armstrong focussed on one race - the Tour. Just about every other race that he rode was part of his Tour preparation program. Already Alberto Contador has stated that for 2009 he has just one goal - the Tour. To be able to focus your whole season on just one race is a thoroughly modern concept that would be inconceivable to those great champions of the past. The 2007 Tour de France was Contador’s first Grand Tour victory. As has happened with sickening regularity in recent years that race was rocked by a series of drug scandals. The two most sensational stories were the positive drug test of Team Astana’s Alexandre Vinokourov (and team-mate Kaschekin) and then a few stages later the removal of Michael Rasmussen from the race by his own Rabobank team for lying and trying to cover up for missing out-of-race drug tests. Rasmussen’s downfall was even more sensational because he was wearing the Yellow Jersey when Rabobank fired him. Contador and his team won the race ‘clean’ but at the end of the 2007 season the sponsor (Discovery) withdrew from the sport and the team was dissolved. During the winter break the sponsors of team Astana decided to continue with their team and implemented a radical house cleaning. Johann Bruyneel, who had achieved eight Tour victories as team manager with Armstrong and Contador, was talked out of retirement and invited to head up Astana. Bruyneel rebuilt the team from the ground up and many of his former Discovery riders and support personnel joined him (including Contador). Regardless of Bruyneel’s efforts, Team Astana had created so much scandal at the 2007 Tour that the organisers wanted revenge. Astana was simply locked-out of the 2008 edition of the Tour. No matter that management, riders and just about everything about the team was new. Just the name ‘Astana’ was toxic poison as far as the Tour organisation was concerned. Consequently in 2008 Contador was unable to defend his Tour de France Championship. Forced out of the Tour, Bruyneel needed to redesign his 2008 program. Consequently the Giro and the Vuelta were targeted. But at first even this plan was put in doubt as the Giro organisers took the same stand as their colleagues over at the Tour. With little over a week to go before the Giro started, the organisers reversed their decision and invited Astana. The mad scramble to get the team and all of its support equipment to Italy on time is an incredible story of itself. However they all got there but the riders had not been preparing for the race. They needed at least the first week to ride into form. That they did and Contador came home with the Pink Jersey. July came and went without Astana in France. Then in September the team was greeted with great enthusiasm in Spain, where Contador claimed his third Grand Tour victory. Ironically the 2007 Vinokourov and Team Astana affair at the Tour de France eventually forced Alberto Contador to display his talents elsewhere. As a result he joined a very short list of legendary champions and added another golden page to cycling history. From this point of view the 2007 Team Astana scandal turned out to be a blessing in disguise.